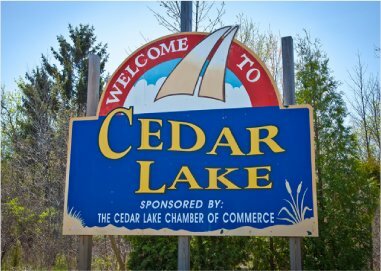 Welcome to your one-stop resource for all things Cedar Lake Real Estate! The 794-acre lake at the center of the community from which the town of Cedar Lake hails its name is an outdoor recreation destination for residents and visitors alike. Over a century ago the Monon Railroad reached the western shore of the lake making the young town a tourist hot spot for Chicagoans escaping the hustle and bustle of city life. That was in 1882. Today, with over 6000 feet of accessible shoreline, picnic tables, gazebos, and 18 acres of open space Cedar Lake is a wonderful place to raise a family, rest and recharge, and enjoy the great Indiana outdoors. The lake has two public marinas with access for boating, jet skiing, and fishing, and don’t forget ice fishing in the winter and snowmobile races across the lake. Upscale condos and houses are newer to the area. In Cedar Lake, it’s resort living with close proximity to Chicago and Lake Michigan. Learn more about Cedar Lake from our real estate specialists at Jana Caudill Team and request a showing of homes today! One of our personal favorites in Cedar Lake is the Lighthouse Restaurant. The menu offers the best in steak, seafood, and pasta dishes with a wonderful lakefront atmosphere. The Cedar Creek Family Golf Center offers a 9-hole executive public golf course, lighted driving range, miniature golf course, and golf lessons for the whole family. Cedar Lake is also home to South Shore Country Club. Lemon Lake County Park features a 403-acre lake, a one-mile paved path, and over 5 miles of terrain path through hilly, wooded areas. There is also playgrounds, open space, sand volleyball courts, softball fields, fishing, multiple Frisbee golf courses, and a leash-free dog space. Lake of the Red Cedars Museum highlights the history of the Cedar Lake area over the years. The Cedar Lake Summerfest happens every July featuring fireworks, games, rides, a bingo tent, beer garden, live entertainment, a laser light show, and car show. Don’t forget all those fun summertime foods like elephant ears, funnel cakes, corn dogs, and more! According to City-Data.com the median household income for Cedar Lake homes from a 2016 study shows an income of $66,548 compared to $52,314 for all of Indiana. Median home values for Cedar Lake in the same time frame were $174,431 compared to $134,800 for the rest of the state. For current, up to date information on homes for sale in Cedar Lake visit this link or contact our office to set up an appointment. Your Cedar Lake address will determine which public school district you reside in. Check the links under “More Info” to determine if you reside within Center, Hanover, or Tri-Creek Townships. Although there are no universities in Cedar Lake, nearby colleges include Purdue University Northwest, Indiana University Northwest, and Calumet College. Cedar Lake Emergency Medical Services are available locally. Additional medical facilities and hospitals close to Cedar Lake include Franciscan St. Anthony Health Center in Crown Point, Pinnacle Hospital, also in Crown Point, and Franciscan St. Margaret Health Center in Dyer. The closest Amtrak stations are in Dyer, about 10 miles away and Homewood, approximately 19 miles away. Whether you have a question on buying a home in Cedar Lake, selling a home, or any other Cedar Lake, Indiana Real Estate question please call or email us. We’re always happy to help!